Chelsea Football Club’s top players have joined a global Jewish initiative to raise awareness about the Holocaust around the world, and the dangers of antisemitism and xenophobia amid a rising tide of nationalism. It is the latest move by the club’s Jewish owner Roman Abramovich to highlight a scourge still seen and heard among Chelsea supporters. 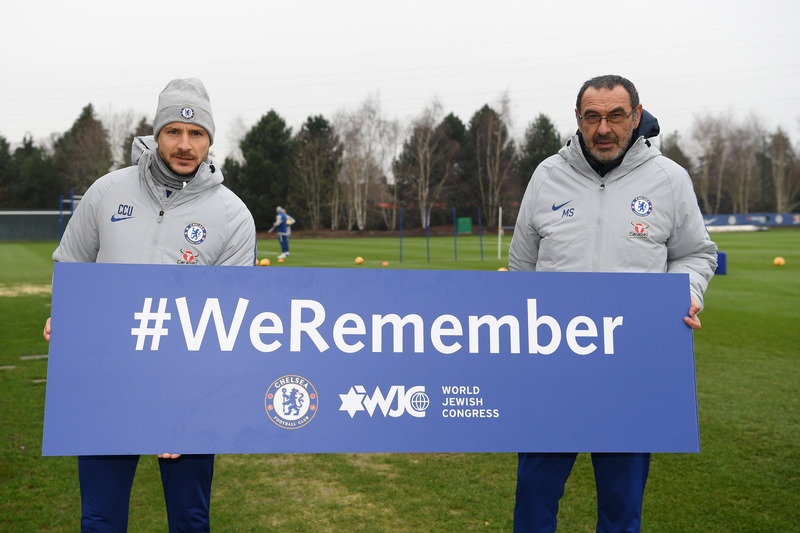 The club’s top male and female players and coaching staff lined up to promote Holocaust awareness this week in photos and videos for the third annual We Remember campaign, organised by the US-based World Jewish Congress (WJC). Among those taking part were Chelsea’s manager Maurizio Sarri, men’s team captain Cesar Azpilicueta, star player Eden Hazard, defender David Luis, striker Olivier Giroud, left-back Marcos Alonso, and Brazilian midfielder Emerson Palmieri. Brazilian club Corinthians joined Chelsea in highlighting the campaign. 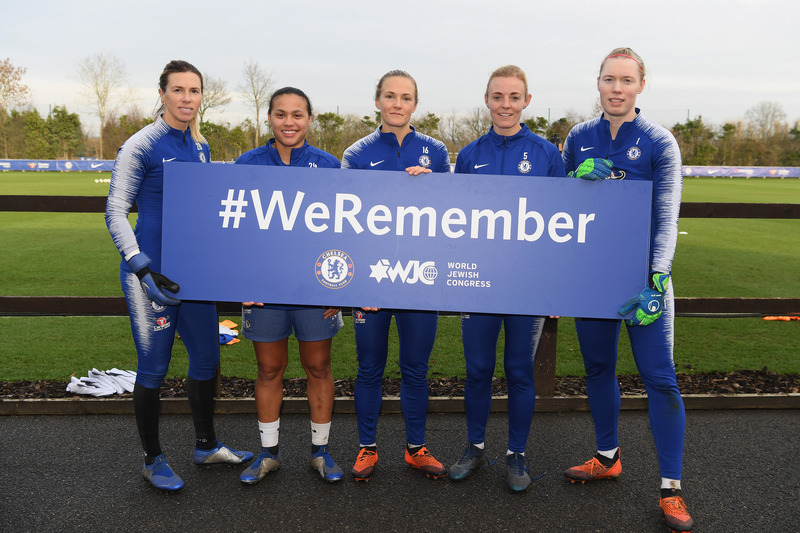 Chelsea’s women’s team also got involved in the campaigns promotion, including England’s national goalkeeper Carly Telford, midfielder and fellow England national Drew Spence, defender Magdalena Eriksson, Welsh captain Sophie Ingle and Swedish goalie Hedvig Lindahl. “With levels of antisemitism, xenophobia and Holocaust-denial rampant and rising across the world, it is imperative that the memory of the Holocaust be shared more widely than ever,” said WJC president Ronald Lauder. A recent report by the European Union Agency for Fundamental Right found that most European Jews felt antisemitism was getting worse, and a CNN poll found that more than a third of Europeans knew little to nothing about the Holocaust. This comes as Jewish News teamed up with Chelsea Football Club to hold a fundraising dinner featuring untold stories of strength and survival from the horror of the Holocaust. Light from the Dark will take place at the club’s Stamford Bridge stadium on 24 January and all proceeds will go to the Imperial War Museum’s (IWM) project to redevelop its Second World War and Holocaust Galleries. Hosted by award-winning comedian and writer David Baddiel, the evening will feature inspiring stories from Holocaust survivors, including renowned journalist Hella Pick.